Pyongyang is capable of launching an ICBM with a nuclear warhead from a hard-to-track mobile launcher at the US West Coast, the US aerospace defense commander has said. The capability is disputed by a study from leading North Korea-watchers, however. “Our assessment is that they have the ability to put a nuclear weapon on a KN-08 [ballistic missile] and shoot it at the homeland. We assess that it’s operational today, and so we practice to go against it,” Admiral William Gortney, the head of NORAD and the US Northern Command, told reporters Tuesday, citing intelligence assessments. “We’re very concerned about the mobile nature of the KN-08. We lose our ability to get the indication that something might occur and of course the unpredictable nature of the regime that’s there,” Gortney said, adding that NORAD is nevertheless “confident we’ll be able to knock it down,” should it ever be launched at the US. Meanwhile, a new report compiled by Johns Hopkins University’s US-Korea Institute has stressed that North Korea’s neighbors are the ones facing the biggest threat from its arsenal, while Pyongyang’s capability to strike the US remains questionable. “North Korea’s current delivery systems consist of about 1,000 ballistic missiles and a small number of light bombers able to reach most targets in South Korea and Japan,” said a paper titled “The Future of North Korean Nuclear Delivery Systems” published on 38nort.org. Some of the missiles include Taepodong, Nodong and Scud missiles. “The current force is more than able to accommodate any future growth in the North’s nuclear weapons arsenal, including a worst-case projection of 100 nuclear weapons by 2020,” the report said. However, the study noted that to pose a direct threat to the US, North Korea would need foreign technology and upgrades. It outlined three possible scenarios for Pyongyang’s nuclear arms capabilities by 2020, with the average saying the KN-08 may only achieve “emergency operational status” by that time. 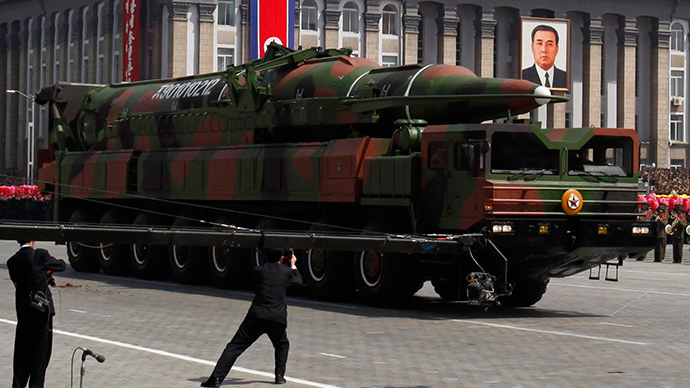 The assessment of North Korea’s potential nuclear arsenal ranged from 20 to 100 warheads. According to the authors, the DPRK’s test program and access to foreign technologies are currently extremely limited, and there has been a striking difference between the country’s military tech progress in comparison to such states as Iran and Pakistan, which at one time used North Korean assistance to develop their own missiles.